Have we now found a way for immunotherapy to work in pancreatic cancer too? We have seen a lot in the press recently about the advances in immunotherapy for many cancers and, in the case of melanoma, with extraordinary results. We’ve not as yet seen this happen for pancreatic cancer which, so far, has proven difficult to treat with either conventional chemotherapy and/or novel immunotherapy. Some trials of immunotherapy (which targets the body’s immune system to fight the cancer) have failed and, it is believed one of the reasons for this is that pancreatic cancer tumours are cunning in the way they are able to manipulate the immune system to help their own progression. Our immune system contains many different types of cell, whose job it is to detect and destroy dangerous invaders such as viruses and bacteria in order to prevent serious diseases. What is important is for these cells to also be able to recognise the good bugs, such as healthy bacteria in our gut, which are important for maintaining health. A very important cell in our immune system is the T-cell (or T lymphocytes) and these cells patrol our system, looking out for anything that could be harmful and, when encountering such, will decide whether to attack. Cancers actually contain lots of T-cells, but, for some reason they seem not to recognise that the cancer is a threat. Scientists have discovered that T-cells in cancers actually contain a molecule that tells them not to act. Many immunotherapies have focussed on what they call this ‘molecular handshake’ to allow the T-cells to do their job and kill the tumour cells. However, for pancreatic cancer, the tumours are encased in a thick layer of proteins and cells which act as a barrier to stop the immunotherapy dugs from getting to the tumour and destroying it. This is why immunotherapy trials for pancreatic cancer have, so far, shown disappointing results. Now a new study by researchers at the Beatson Institute in Glasgow and published in the journal Cancer Cell1 has found in mouse models and human studies that pancreatic cancer tumours contain a protein (called CXCR2) which protects the tumour by controlling the immune system and preventing it from acting. The scientists have found a way to block the CXCR2 protein using a drug: AZD5069 which has previously been studied in COPD, asthma and is being looked at for head and neck cancers. By blocking CXCR2, scientists found that there was an initial ‘rush’ of T-cells into the tumour and that this is what can prime the tumours making them more sensitive to chemotherapy drugs as well as immunotherapy agents. Ultimately it is hoped that this will lead to tumour cell death and reduction of the tumour. While more studies are needed, it now looks like there could be real hope that we can find an effective immunotherapy agent for pancreatic cancer – ultimately unleashing a new weapon against the disease, which is very much needed. I have Type 3c Diabetes – what is that all about? This week is #NationalDiabetesWeek and social media has been full of interesting facts and hints and tips on how to manage either Type 1 or Type 2 diabetes. What I have noticed though is that no-one has, thus far, mentioned Type 3 diabetes. This hasn’t come as a surprise. A year before I was diagnosed with operable pancreatic cancer, I was told that I may have Type 2 diabetes. However, I wasn’t overweight, nor did I have a family history of the disease. We now know that it was probably the cancer causing the blood sugar level elevations and this link between new-onset diabetes without weight gain (which can occur 1-3 years before a pancreatic cancer diagnosis) is something that we at Pancreatic Cancer Action are investigating in our research programmes. For all of these years (nearly 9) I have believed that I have Type 2 diabetes. However, at a recent consultation with my new Diabetologist, I discovered that I have in fact got Type 3c Diabetes. This I had never heard of before and so went about trying to find out more. I looked at some informed websites including Diabetes UK and found nothing. Not even a mention. And not all of the medical profession has heard of this type of diabetes either – unless they are specialists in this field. Never being one to give up, I kept on researching. 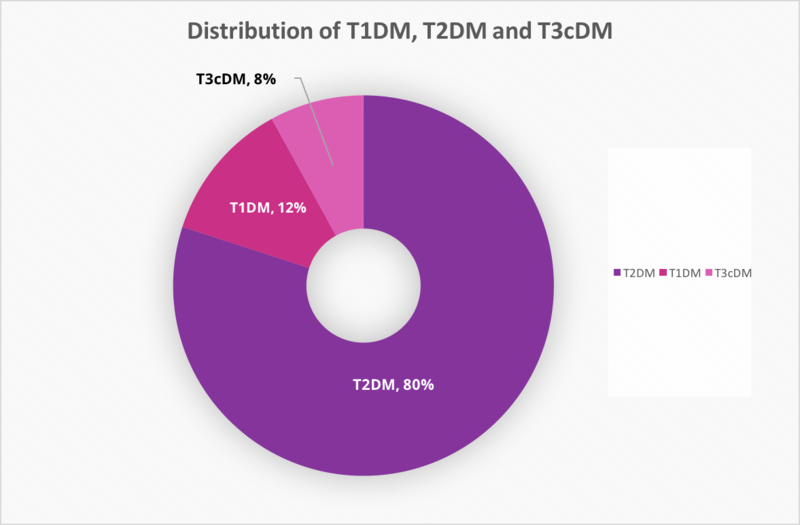 I have since found out that, of all diabetes cases Type 3c makes up about 8%1 – not a lot, but not insignificant either. Patients often have Pancreatic Exocrine Insufficiency (malabsorption) and are on Pancreatic Enzyme Therapy (PERT) to help them get their nutrients from food. Initially, my diabetes was considered a ‘side-show’ to the pancreatic cancer and rightly so. Treatment for it started with a combination of gliclazide medication and diet, but over the years my glucose control has declined. Gradually an insulin regime was introduced and, with increasing lack of glucose control (despite being very strict with my diet) the gliclazide has been removed, metformin added (slow release) daily, with insulin injections with meals and snacks and at bedtime. My diabetes is difficult to manage – I am strict with my carb intake (to the point of being obsessive) and I have taken advantage of new technology in the form of a Freestyle Libre monitor system to help me regularly check my glucose levels without the need to prick my fingers. This is at great expense to me as this system is not funded by the NHS, and each monitor (which lasts 2 weeks) costs about £50. What is difficult for me is that there is little or no information for patients on how to manage Type 3c diabetes. Do we follow a regime for Type 2 patients or Type 1? Not knowing makes me feel like all of this is a bit of trial and error. I’m lucky to be very closely monitored by my specialists who are helpful in finding strategies I can adopt to get my sugar levels under better control. I am also lucky that, following my pancreatic cancer diagnosis nearly 9 years ago, my primary health concern is now my diabetes control. And, while it is a nuisance and an intrusion into every-day living, this is something I can live with because I am living many years after being diagnosed with pancreatic cancer – something that happens for only the very few. It has been an amazingly inspirational couple of days at the very first World Pancreatic Cancer Coalition (WPCC) meeting in Orlando, USA. Over 54 delegates from 24 countries attended and I had the pleasure of meeting some people who I had only previously known through social media or conference call and email exchanges. There were many more who I was meeting for the very first time – representatives from organisations big and small but, regardless of size, were there for one common purpose: to change the landscape for pancreatic cancer on a global level. The WPCC has been in development for just under a year under the stewardship of the Steering Committee comprising of Chair, Julie Fleshman, CEO and President of the Pancreatic Cancer Action Network in the USA, myself as co-Vice Chair alongside Alex Ford and Barbara Kenner from the Barbara Kenner Family Research Fund (USA). In this short time we have managed to found the WPCC, set its constitution, develop the branding, develop and launch the website http://www.worldpancreaticcancercoalition.org as well as bring together the very first WPCC meeting. Julie Fleshman had assigned some of her team to work on the logistics of this event – and thanks to her and her team, everything worked like clockwork! One of the key components of the meeting was to have a facilitated brainstorm session to carve out the future priorities and plans for WPCC. This was a very energetic session and there are many key initiatives both for the short and for the longer term that we have taken on board and will publicise once the priorities have been finalised. As Chair of World Pancreatic Cancer Day, I along with Ruth Fitzgibbons from our creative agency, The Richards Group, presented to WPCC the plans for the Day in 2016 (17th November 2016). Historically, the World Pancreatic Cancer Day (WPCD) was an initiative of its own and it is from that has provided the springboard for the WPCC. Now, WPCD is one of the key initiatives of the WPCC. More will be revealed about WPCD to the wider world later, but suffice it to say, the WPCC members were very engaged and excited by the concept we presented and we hope that WPCD on 17th November will be the best EVER! The WPCC Steering group outlined the governance structure of the Coalition and encouraged members to apply for places on both the main WPCC and WPCD steering committees. What went down extremely well were the presentations by Coalition members about their activities in their countries. There were many inspiring presentations about initiatives members have developed and run to raise awareness of pancreatic cancer. A lot of learning points and some novel ideas were presented. We also had presentations on social media strategy and PR relations skills. This was especially beneficial to smaller organisations in the meeting who do not as yet maximise social media on a daily basis. What we all found very interesting were the scientific presentations by Dr Anirban Maitra and Prof Margaret Tempero (she’s one of PCA’s Scientific Advisory Committee Members). Both presented good overviews of the research landscape in presentations that weren’t too technical in nature and were easily understood by all. The key thing I took away from this inaugural WPCC meeting is that there are a lot of people out there across the globe doing amazing work in the pancreatic cancer field. And, while that work may be diverse and different, what we all have in common is a fierce drive and passion to effect change for pancreatic cancer worldwide. Now we have come together, we will be a collective force to be reckoned with. So, watch this space and if you want to help us, please get behind World Pancreatic Cancer Day on 17th November – it’s going to be a good one! At the Primary Care Society of Gastroenterology, I presented to primary care specialists with an interest in gastroenterology. While they naturally knew about pancreatic cancer, many were informed by the statistics, the causes and risks and some were amazed by the link between new-onset type-2 diabetes not associated with weight gain. This is something that can happen to patients up to 2 years before diagnosis and indeed, happened to me a year before my own diagnosis. Many were very interested in joining with us in our research project to audit patients in primary care with a diagnosis of type 2 diabetes and a BMI of less than 25. We hope to be able to extend more widely our pilot study in 2016. Here I presented to a conference of international scientists and clinicians from across the globe, all with an expertise in pancreatic cancer. It was a large, well-attended conference and the sheer size of the conference hall was a little daunting. I spoke about the European situation for pancreatic cancer: about how it is the fourth leading cause in cancer death in Europe and that there are vast differences in both one and five-year survival rates between countries. 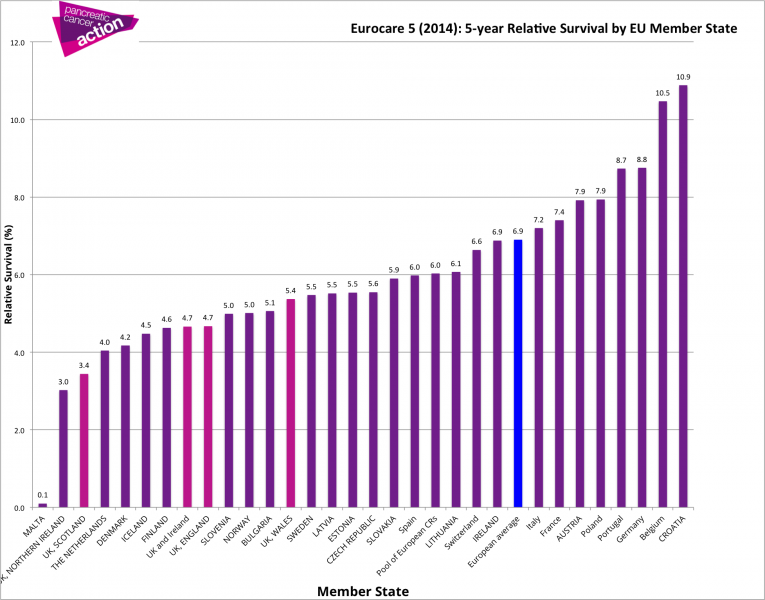 Sadly, UK countries fare really badly in these league tables with some of the worst survival rates across the whole of the EU. The ‘Platform’ is made up of specialists, researchers and patient groups across Europe and I am the UK representative. I told the conference about the three workstreams: Awareness (which I head up), Diagnosis (of which I am a key member) and Registries. I let them know too about the outputs of those three groups – 10 key facts booklet, a symptoms poster (based on the PCA one! ), a EU Parliament Declaration, a GP fact-sheet on how to spot pancreatic cancer and an update of the crucial work of the registries project – to consolidate and improve the data we hold on pancreatic cancer, its diagnoses and treatments across the EU. My talk was very well received and afterwards many clinicians wanted to have copies of my slides for them to communicate the messages in their own countries. On Monday, I flew in to Brussels to have talks with MEPs about the work of Pancreatic Cancer Europe and also to have a meeting with with the Platform Members. 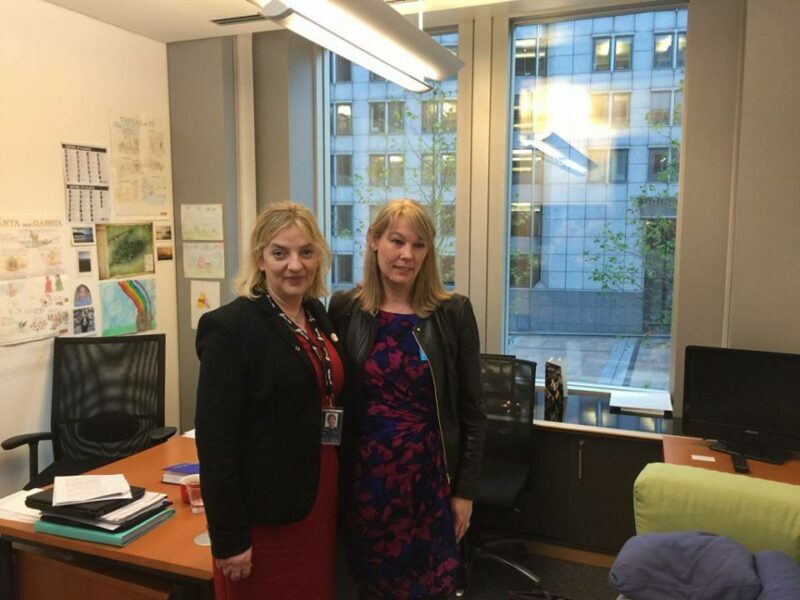 The MEP meetings were to encourage them to support the Platform but also to get them to sign the declaration document to enable increased focus on pancreatic cancer in the European Parliament. 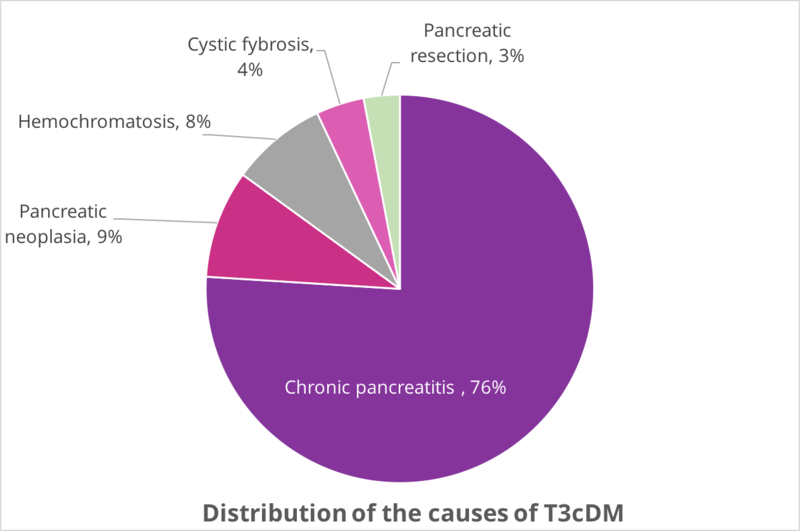 The Pancreatic Cancer Europe meeting was very productive – included the final plans for dissemination of the workstream outputs including translations into 12 languages of the key documents and an introduction of the website (www.pancreaticcancereurope.eu) and an awareness microsite for WPCD2015. 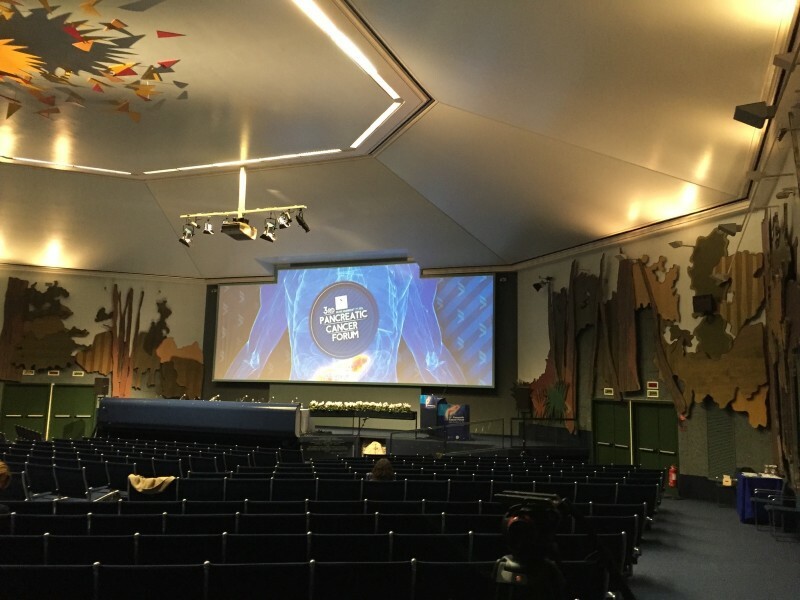 It was agreed that for 2016 there would be another Workstream for a communications function and this would be run by the European Cancer Patients’ Coalition (ECPC) of which PCA is a member. I will be heading up ECPC’s workgroup for pancreatic cancer in 2016.
continuation of communication/dissemination of the workgroup outputs. collation of the European specialist centres for pancreatic cancer on the website (for patient information). It was discussed that a criterion should be set for exactly what constitutes a specialist centre – surgical Whipple’s throughput as one, clinical MDT, relevant palliative care pathways etc – these exist in both the UK and in Germany. Early diagnosis function to work with COST ACTION (EU Pancreas) to work on the key clinical areas and research priorities. Exploration of diabetes mellitus not associated with a metabolic condition (current work of PCA), CA-19-9 and other tumour markers. Access to latest chemotherapy drugs. Encouraging other countries to take part in the registry trials. Also there was discussion surrounding the governance – what type of legal entity should we be working with – as little bureaucracy as possible – clinicians having little time for this. I was invited by K.E.F.I – a cancer patient group in Greece to speak at their pancreatic cancer awareness event in Athens to mark World Pancreatic Cancer Day. I was presenting with a specialist surgeon, a specialist oncologist, a specialist nurse and a palliative care consultant. It appears that services for patients are not quite as joined up as they are in the UK and that some patients do not get access to all available treatments, especially palliative care and pain management. My talk not only included my experience as a patient of pancreatic cancer but was used to disseminate the work of the Multi-Stakeholder Platform to the Greek people. We were joined by a 10-year survivor of pancreatic cancer who was speaking for the very first time about his diagnosis and treatment. His talk was not only inspiring, but it was extremely emotional and a powerful way to put across the messages about the disease. It’s been a long and tiring week but well worth it. The encouraging thing is that there is now a community of like-minded people who want to improve pancreatic cancer survival and the patient experience across Europe. This is the beginning but the momentum is building and building fast. I am pleased to be able to play a part in this and take it to the next level. Exciting times are ahead for pancreatic cancer awareness in Europe! Why the pansy means so much to me? When I launched Pancreatic Cancer Action in 2010, I chose the pansy to be the logo at the time. While the Pancreatic Cancer Action logo has been updated, the pansy is still an important party of the charity and to me personally. It all started with the colour purple. Some, all or none of you may know that purple is the internationally recognised colour for pancreatic cancer. Pancreatic cancer charities in the USA universally adopt the purple colour in their branding. Other pancreatic cancer organisations in the UK and abroad have also adopted purple as their brand colour. We have all seen what pink can do for breast cancer, so maybe purple can do the same for pancreatic cancer? We can but try. So, we have the colour and we are a charity in the cancer sector. Surely we need a ribbon, don’t we? Well, we could, but the ribbon, to me, doesn’t say anything other than cancer. And while we are an organisation dealing with cancer we are also dealing with other things too such as awareness and survival. So, back to the pansy. Although it is found in other colours, the pansy fits the purple theme rather nicely and what is even more special is that it flowers during November (the winter variety anyway), which is the month during which we have Pancreatic Cancer Awareness Month. However, while the pansy ticks the boxes on colour and flowering time, to me the most important symbol of the pansy that it is a living thing. Having a living thing as a logo is important, as I want it in itself to convey a message of hope. The main focus of our work here at Pancreatic Cancer Action is to raise awareness of the disease and that means shouting about the dire survival rates, the fact that nothing has improved for over 40 years, the underfunding of pancreatic cancer relative to the disease burden and to stop pancreatic cancer from continuing to sit in the shadows of public consciousness. This is all too difficult to hear when you yourself have been diagnosed with the disease. A plague of negative statistics can be upsetting. The flip side to this is that I too am a pancreatic cancer patient and as a survivor, I want to offer some form of hope to others who have found themselves in the same situation I did 6 years ago in August 2007 when I was diagnosed. And I continue to campaign so that more people will be able to have the same outcome that I have had. Hope when there seems none is difficult to maintain unless there are advocates promoting the potential of hope. Celebrity or not, that campaign mantle role must be filled in order to awaken society to the realities of this disease – the 5th most common cause of cancer death in the UK and allow for pancreatic cancer, its risks, symptoms and prognosis to be familiar to us all. Is a celebrity’s battle with cancer secret or private? We’ve sadly seen a few of our treasured celebrities and legendary greats such as David Bowie, Lemmy, Alan Rickman and lately Sir Terry Wogan pass away from cancer over the past few weeks. Alan Rickman, we now know, suffered pancreatic cancer. Not a nice start to the New Year, especially for their families and friends. And while the media and press has been full of tributes, the headlines have screamed “silent battle with cancer”, “he kept if from all but his closest friends” and “nobody knew”. Celebrities have chosen a career that has taken them into the limelight, the media spotlight and in some cases, such as Terry Wogan, they are such a household name we think we know them. However, celebrities, like you and I are human too and a diagnosis of cancer is one that can be devastating for the patient and those around them. It’s a diagnosis that can be difficult to deal with when you do not have the world’s media trained on you let alone when they do. In the age of Twitter, one’s every move can be instantly shared with the globe – especially if you are famous. And, sometimes, when someone is in the public eye, the press and other media think they have a right to know and to tell the world. As someone who is keen to raise awareness of pancreatic cancer, you may have thought that I would have wanted these celebrities with the disease to “come out’ and be public about what they are suffering when they are still alive. After all, the media attention this would bring to the disease can be enormous and we do need so much more attention focussed on pancreatic cancer. But, in my opinion, this isn’t the way to do it. 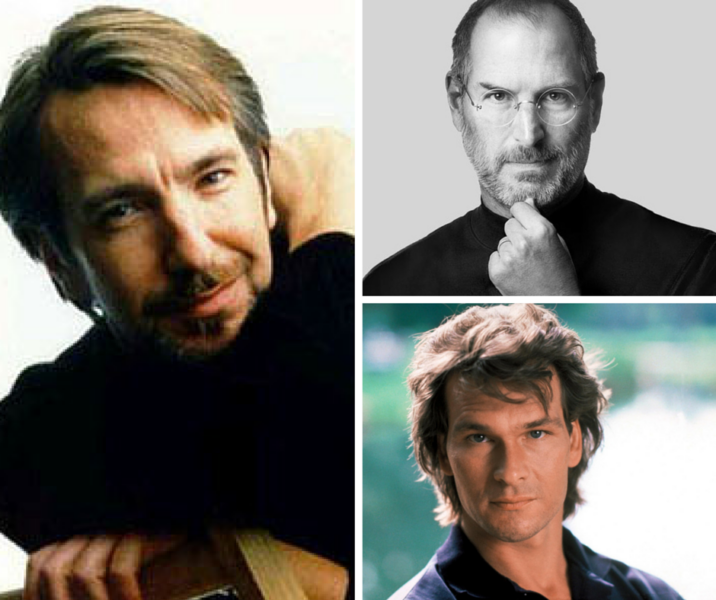 I remember poor Patrick Swayse (and to a certain extent), Steve Jobs, both of whom eventually went public with their pancreatic cancer diagnoses. I remember how brave Patrick was in particular about talking about his disease and about how he was going to beat it. His positivity certainly helped him survive a lot longer than the average, however the media were not always on his side. Keen to get the latest shot of a thin, gaunt man clearly in the last stages of his illness, they stalked him as he went to his chemotherapy sessions or to the doctor’s clinic. This kind of salacious reporting is not in the public interest. It doesn’t help further the cause and in my opinion, there is a huge difference between what is ‘public interest’ and the fact that the ‘public is interested’. Celebrities are keeping their illness private, not secret and we should respect them for that. There are so many reasons why a celebrity will want to keep their cancer diagnosis private; they may be worried about other people’s reactions, negative speculation in the media, not wanting people to feel sorry for them and, importantly, to protect those around them. To further the cause for pancreatic cancer, we need to have celebrities who have, like me, survived the disease to become advocates for change, to show the world that with an early diagnosis it is possible to survive and that with a focus on improving early diagnosis we will change the numbers for pancreatic cancer. My condolences and thoughts are with all families recently bereaved by cancer, whether they are a celebrity or not. This week, NHS England have been reviewing whether the chemotherapy drug Abraxane should remain on the Cancer Drugs Fund (CDF) in England. Currently, the combination of gemcitabine and Abraxane is routinely available on the NHS in Scotland and Wales but patients in England (who make up 83% of all pancreatic cancer patients) are only able to access the drug by applying to the CDF. If Abraxane is taken off the CDF, then patients in England will only be able to access it privately. This is an unacceptable situation and why we have spent this week raising this issue in the media. 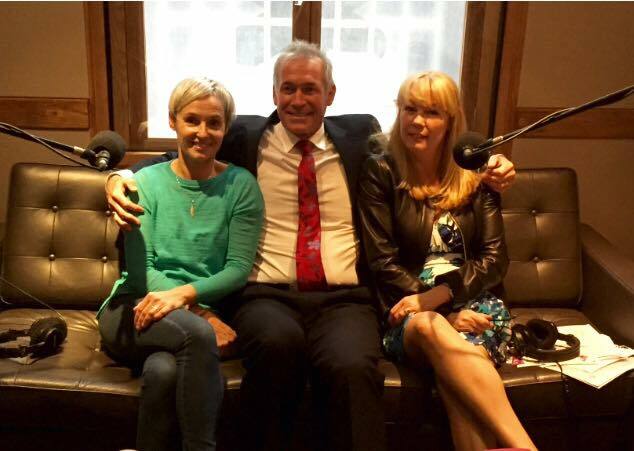 On Tuesday, Pancreatic Cancer Action CEO and Founder (and nearly 8 year survivor of pancreatic cancer) along with Penny Lown (pancreatic cancer survivor and one of the faces of last year’s advertising campaign) and Broadcast Medic and GP, Dr Hilary Jones gave over 20 radio interviews across England. On World Cancer Day, Cancer Research UK released new statistics to show that cancer deaths are falling with ten year survival rates of some cancers improving significantly since 1971. It is of course fantastic to see such an increase in survival rates with testicular cancer rates increasing from 69% to 98%, and 57% of patients diagnosed with bowel cancer, which used to have one of the lowest survival rates, will now survive ten years. As you can see in the graph below, many cancers have much better survival rates. The media attributed this completely shocking situation to the fact that pancreatic cancer is diagnosed too late. As a charity who focus on early diagnosis, we are all too aware of this problem, which is why we fund awareness campaigns and GP educational programmes. However, one of the reasons that many cancer survival rates have improved significantly is because of huge investment in research and awareness campaigns for other cancers. If you would like to support our campaign for more funding, please write to your MP today, to highlight the issues. We have a dedicated way to find and contact your MP: http://write.pancreaticcanceraction.org/.